So far the summer of 2006 has been wonderful - with warm sunny weather, little rain, and days and weeks of cruise ships visiting and a queue of festivals and special events. The summer kicked off here with two viking festivals on the same weekend (7 - 11 June) - Hafrsfjordspillene at the Three Swords monument near Stavanger complete with Opera and at Avandsnes on Karmøy near Haugesund. Great weather, but a pity the two events clashed. The world tour FIVB beach volleyball tournament in Stavanger harbour was at the end of June. This competition brings together the best beach volleyball players in the world, both men and women, and Vågen in Stavanger makes a popular venue. This year two volleyball courts and a bar/restaurant were placed on a barge in the harbour, which was brilliant thinking - the quaysides were not so crowded and more people could see and enjoy the action, in warm sunny weather. 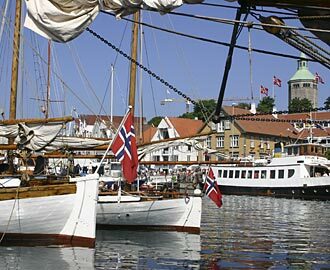 Starting now is the International Chamber Music Festival in Stavanger (ICMF), while at the same time in Haugesund the Sildajazz festival starts, and the whole of Mandal (Norway's most southerly - and sunniest - town) parties til it drops for the Skalldyrfestivalen, or Seafood Festival. That's not the end - there are festivals in Haugesund and Bergen still to come, and many more special events before summer comes around again.